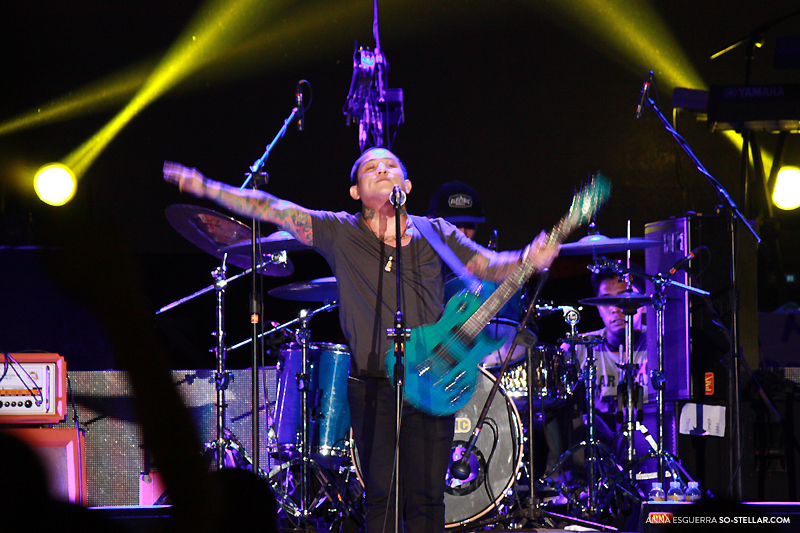 Urbandub from last year during the Jack TV MADFest Event, and the last time I watched them. April 1: The band posted on their Facebook page the announcement that they are splitting and going their different ways. This left many people confused and unsure whether to take the news seriously because it was April Fool’s day – the day where you take every news bit announcement with a grain of salt. Towards the end of the day, many people’s speculations turned out to be true, much to their dismay and disappointment. They are, indeed, breaking up. The following day, some major local newspapers have published the news. It does not get any more official and confirmed than a nationwide print. It’s already April 4 and, there’s still no announcement that they’re playing us all along. Guess that makes it super duper mega official. 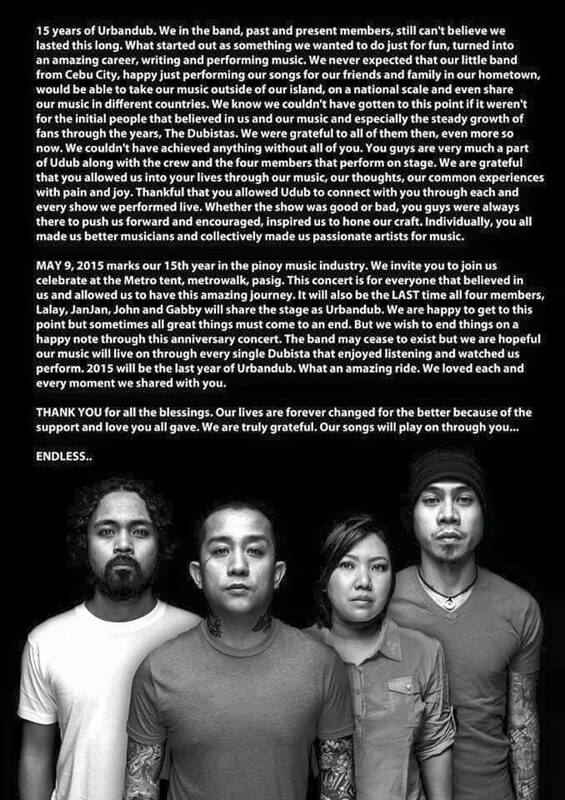 So there’s that.. Urbandub no more. BUT HOLD ON, SKIPPER. They will be playing a show on May 9 at the Metrotent Convention Center. It’ll be the very last show. Prior to that, I think there will be other shows around this month to be held at different bars around the metro.. so if you can’t make it next month, make sure to catch them in the smaller shows this April. They’re actually giving people a lot of chances to watch them for the last-last-last-er(? lol) time. My opinion of this, though, is that shouldn’t their final show be held at the place where they originated from? In Cebu, where they started. I think it is safe to assume that Cebuanos helped big time in putting this band on the map and it would be respectful if they closed up shop there instead of doing it in Manila. 2005: Going back to 10 years ago, the internet that we know now was in its infancy back then. Whatever technology we have now, did not exist yet around this time. Twitter was unheard of. I spent most of my time lurking around local forums catering to the Philippine music scene – best known as OPM. The local rock music scene played a very important role in my world back then. Through these Yahoo! 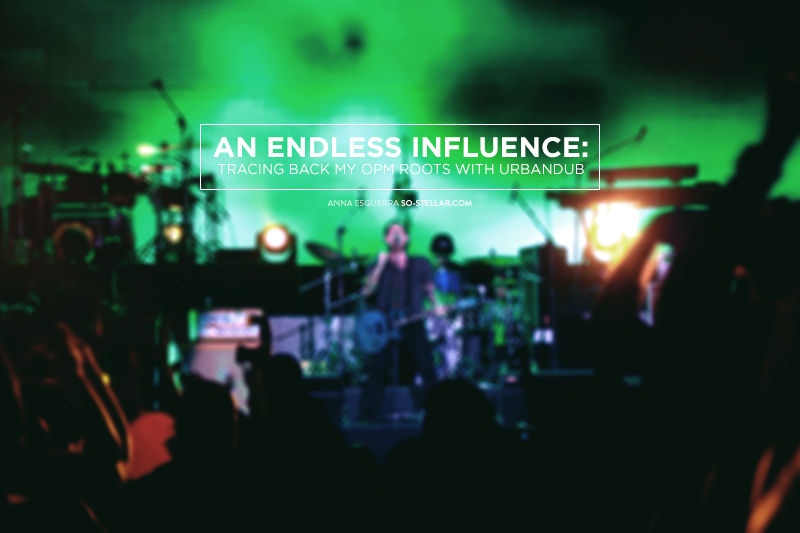 Groups and conversing with people and newfound friends then, it was how I discovered Urbandub’s music. To be more specific, through Pupil’s music… which led me to their Mailing List, talking to people, heard about this new band in passing. There. Bit of backstory on Pupil: They were the first ever OPM band I followed and kept tabs on, til I became active enough to be recognizable online and offline, etc etc. Started w/ Ely Buendia, around second year highschool when a good friend introduced me to OPM through Eraserheads’ music. Fast forward to the present, I haven’t been to many local gigs, but whenever they have a new album out I keep myself updated and grab a physical copy of the CD. I had heard of Urbandub’s music, followed by discovering the following roster of bands after: Kapatid, Bamboo, Greyhoundz, Rivermaya, 6 Cycle Mind, Spongecola, Wolfgang, Razorback, Sandwich, Imago, and more. All these bands are easily part of my soundtrack of my teenage life, if I were to have one. I still listen to them from time to time, but mostly their earlier albums and I don’t keep track of their stuff after 2008 for most of these bands. Back to Urbandub, a song that I heard first is their cover of Sade’s No Ordinary Love, from this compilation album called Full Volume. I absolutely LOVED it just listening to it for the first time. I just had to check out the whole discography. Wasn’t disappointed to find out most songs were just as great. I was hooked! I think the next one I loved was their collaboration with Dice and K9 in a track called “Apart”. 2005-2011: Quite a rollercoaster along these years because I had to juggle my highschool, then college academic life with my ‘nightlife’. Don’t get me wrong, it’s not as scandalous as it may sound reading that part. I literally just come out at night, to venues accessible to me, just to watch these bands. If I could muster the courage, I’d meet and greet them for a photo and to sign my CDs after. Not a drop of alcohol in my system occurred at all! In the end it was hard to keep up because school was eating my time and the whole scene was starting to change and become intimidating. Check out this song of Urbandub though, called Future. For some reason this song has always stuck in my head. It must have had an importance to me for remember it up to now. OK I know why it’s memorable: Check out how young everyone looked. Armi sporting her signature look before, a long ponytail’d hair. 2015: The band is breaking up and there’s doing a series of shows within this month (as far as I know? I saw one listing for a 19 East gig later this month), with a final one the following month. After that it’s no more. Goodbye. Adios. Or hello to the solo career of some members, or not. Who knows. I found myself going through my CD collection and to my surprise, finding out I have two CDs from Urbandub. I wish I took the time to look for the first two albums, Birth, and Influence, too.. but okay, two is better than nothing. I plan to have these albums signed if ever I make it to one of their final shows. I guess my only regret in my years of following and supporting this band was that I did not invest a lot of time to them. I only saw them frequently. Come to think of it, overall maybe around 3-5x only. Their set during Kimbra’s Jack TV appearance was the last time I’ve watched Urbandub and I just happened to see their set because I arrived late. And the member lineup was not the original, as far as I know. Only the drummer and the vocalist were the original members and the guitarist and bassist were different people at the time. Photos of Gabby Alipe performing was from this show. My first and last Urbandub concert was last May 23, 2015 UBEC. I hope Sir Gabby and Sir Franco, since they always seemed to be together a lot :), will form another supergroup, that would be a hell of a ride. I think there have been instances in the past couple of months where they’ve jammed in one local gig. They’re friends naman (haha close?) and yeah it’s likely for them to form a supergroup. Maybe next year, since Udub is still doing shows under that name until the end of this year daw. Yes! I was waiting for an “april fool’s joke” post after that day they announced about this. But it didn’t turn out to be a joke. 😞 Listening to their music makes me want to go back to my high school era! Talagang everything must come to an end, one way or another, but as their theme nga for the next and last concert… their presence and their music will be ENDLESS. 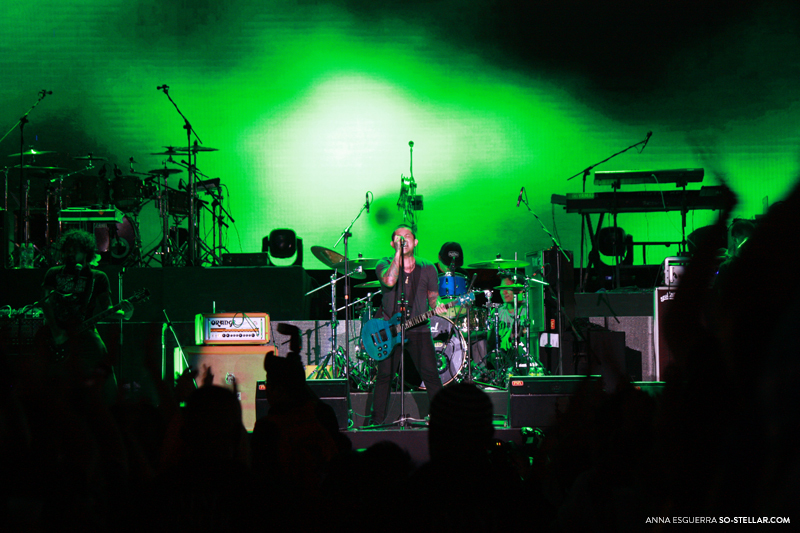 It will go on and on… ♥ OPM is love! Zayn leaving 1D definitely traumatized me quite heavily, haha! I haven’t found such quality music in a while now. Sad time for OPM. Many good deserving and talented musicians are leaving for better opportunities not related to their passion while the terrible are the ones who are here to stay. So annoying and unfortunate, haha! Eto na ang essay-length reply, Anna. Haha. I agree and disagree at the same time. You can always argue that there is support for more “credible” local acts nowadays, but these avenues tend to preach to the choir and are not welcoming to others who happen to wander by. In three years of doing earthings! I realize I have definitely missed out on a lot, and I’m only discovering these acts because I felt like going to one exhibit launch and ended up connecting a lot of dots in between. And these are just the up-and-comers. There are always the heritage acts – Sandwich and Pupil just released albums, and Urbandub last did a couple of years back – but they don’t get as much exposure, either. I’d say it’s down to local music support being spotty lately. There’s always that thing about changing tastes and consumption habits, of how people are leaving TV and radio for YouTube and Spotify. But I think it’s because we’ve lost some really good support. In Manila, for example, we lost NU and Campus Radio – two radio stations that supported lots of local music, regardless of genre, in a welcoming and inclusive manner. It isn’t coincidence that the scene “died down” when those stations died, yes? Sure, local acts still get support from our radio stations today, but the masa stations, designed to play it safe, will stick towards the ballads and the more pleasant pop (ie JaDine, Davey Langit, etc). The so-called class stations only have token slots for local pop, because it doesn’t quite fit their Top 40 philosophy. The only radio station in the country(!) with good support for local alternative acts, Jam, suffers from the need to pander to an audience that wants to be reassured that it is cool. (Also, its take on alternative is quite narrow, for the same reasons.) Sure, the acts they support are happy to get airplay, but outfits today – Jam, Radio Republic, Amplify.ph – only preach to the choir. If I wander by, I’d feel excluded because it just doesn’t feel like my crowd. Weeks back there was talk of a law further strengthening support for local music, and one of the proposals was to increase the number of local songs required on our radio stations, from four per hour (na hindi naman nagagawa) to eight. Will it work? One, consumption habits have changed and people listen for the talk now, so not quite. Two, what’s a radio guy’s motivation to follow this law if he knows his listeners will not appreciate hearing Christian Bautista alongside Charli XCX? Walang market. Kung may gagawa man, ayaw papasukin lahat. Ayaw mag-sell out, ayaw magmukhang jologs. tl;dr — “good” local music is out there, but not everybody wants us to find it. Most kasi are either devastated or sad they won’t be able to see them perform for the last time and just be there with no inconvenience. Your reason makes a lot of sense, haha! Oo nga naman.